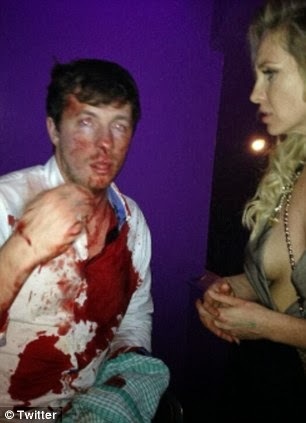 The deaf brother of Big Brother winner Josie Gibson was brutally attacked by thugs because he was unable to help them with directions on a night out. She was out celebrating her 29th birthday with family and friends in her native Bristol when the savages approached Harry and asked if he knew the right way. He started to reply in sign language but the men became angry and lashed out at him. Miss Gibson, who is also known for her weight loss DVDs, tweeted a picture of blood-spattered Harry and expressed her sorrow and outrage at the sickening act. 'Lost all faith in mankind tonight. I went to the toilet and my brother got beaten up for being deaf. 'What a disgusting world we live in,' she tweeted. Harry was left deaf after being struck by meningitis as a baby. A spokesman from Avon and Somerset Police confirmed they were aware of the incident.